The MM301U dual-voltage single quadrant SCR drive controls 90 or 180 VDC SCR brush-type motors ranging from 1/4Hp through 2Hp. The MM301U has integrated isolation allowing it to precisely follow analog current or voltage signals from external devices or a potentiometer as a reference for motor speed control. This results in significant labor and material cost reduction compared to other systems employing a separate drive and isolation card. 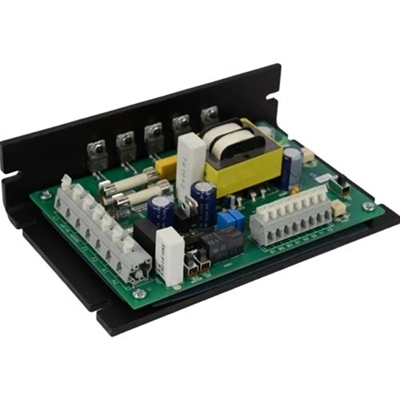 This multi-featured chassis drive accepts optional input for start and stop. Depending on the application, users can run the drive open-loop with armature feedback or closed loop with tachogenerator feedback for enhanced performance. This drive accepts nearly any DC tachogenerator (7-50 V/KRPM), scaleable using an adjustable tachogenerator gain potentiometer.